We booked this hotel only b/c we had a late flight into Miami and were renting a car to drive to the Keys the next morning. Very convenient that it is in the airport and can then just take the tram to car rental agency the next morning. However signs by the baggage claim would've been helpful in finding our way-we ended up asking someone. The room itself was very outdated and run down. Room was very small/tight, at least smaller than it looked in the pictures. I think the room was okay for the night but glad we weren't spending our whole vacation here. I usually sleep with a fan for white noise, but we didn't have any issues with hearing planes take off and land. I'd say this hotel is a good place to crash if it's late or need to sleep on a long layover, but that's all I would use it for, which is probably what it's meant to be used for anyway. Location was excellent after a weeks long trip to walk right out of the hotel to my airlines was most convenient. Shabby but so convenient. Fine restaurant for lingering. Hotel hallway was outdated and carpet worn. Room was small and outdated. Location at the airport was convenient and price wasn't unreasonable. Staff was friendly and courteous. This hotel is in a fantastic location but the hotel itself is dated and in marginal condition. Someone should buy this hotel and convert it from a 2.5 star to a 4 star. The greatest advantage was staying at the airport, in a clean and safe environment. We were able to get up at a decent hour, shower and use the facilities, walk over and check in at the airplane ticketing area, and then have breakfast, and head out to the hub to catch our flight...eliminating the stress of driving, flying to catch another flight, or getting up 5 hours earlier, in order to catch the same flight ...this was a stress-reliever! In the Airport so no worries when catching your flight. A solid three star hotel with a nice bar area good for an overnight stay. 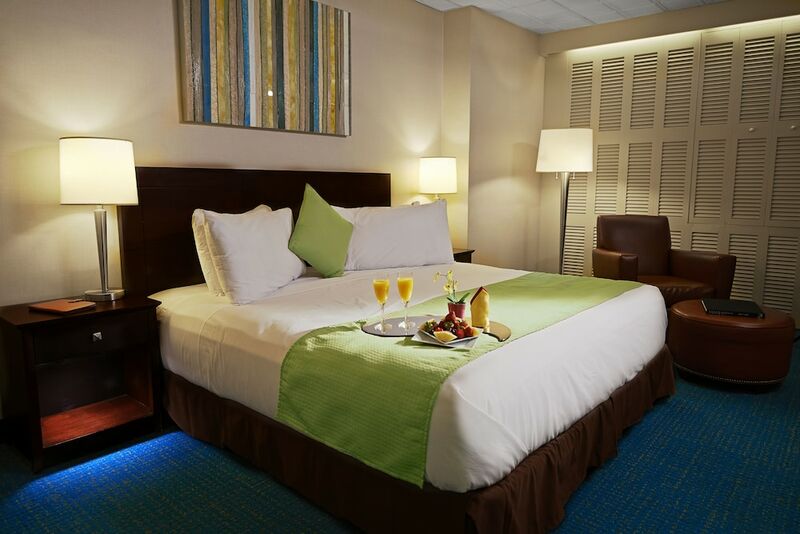 Miami International Airport Hotel is located within a few miles (5 km) of Magic City Casino and Grapeland Water Park. This 3-star hotel has 262 rooms and welcomes guests with a restaurant, free in-room WiFi, and a conference center. Located centrally in Miami, it's connected to the airport and also close to Miami Jai Alai and Miami-Dade County Auditorium. Enjoy a leisurely bite to eat at Air Margaritaville, the hotel's onsite restaurant. Order from room service to satisfy your hunger without leaving your room. Start your day off with cooked-to-order breakfast, available for a fee. A flat-screen TV comes with satellite channels and pay movies, and guests can stay connected with free WiFi. Beds sport premium bedding and the bathroom offers a hair dryer and free toiletries. Other standard amenities include a coffee maker and a phone. At Miami International Airport Hotel, guests have access to free WiFi in public areas, a conference center, and express check-in. The 24-hour front desk has multilingual staff ready to help with concierge services, and answer any questions about the area. Additional amenities include an ATM and a porter/bellhop. Dear Guest, Thank you for choosing our hotel and taking the time to write this review. We are very sorry to hear about your unpleasant experience with our service. Please accept our sincere apologies and hope you give us another chance to welcome you back to our hotel on your next visit. Dear Meggan, Thanks for staying with us. We are glad the hotel location was convenient for your travel needs. We will share your comments with our upper management office in an effort to provide a more pleasant stay for our new guests. We will gladly welcome you back soon. Dear Guest, Thanks for being our guest. It seems that your stay was below your expectations, and I would like to offer you an apology if that was the case. We hope you give us another opportunity to host a more pleasant experience next time around. Dear Guest, Thanks for being our guest. We hope we were able to meet your travel expectations. We would like to serve you again next time around. Dear Guest, Thanks for being our guest. It seems that we met your expectations during your recent stay. We are pleased you gave us another opportunity to host your stay and will be happy to welcome you back. Dear Guest, Thanks for being our guest and finding the time to post a review of your stay. We are glad our hotel and our staff fulfilled your immediate lodging needs. Please come back and stay with us. We will be happy to have you as our guest again. Dear Guest, Thank you for your kind review. We are charmed to know you had a relaxing stay and that we were able to accommodate your needs. We look forward to your next visit. Dear Guest, Thanks for staying with us. Our team works hard to make our guests happy and appreciate your feedback. We are pleased you enjoyed your stay with us and look forward to your next visit. Air Margaritaville - Restaurant and bar serving breakfast, lunch, and dinner. Kid's menu available. Open daily.